Lori Riviere and Maria Maloof, the ultimate It Girls and founders of the It Girl Group, bring together South Florida fashion aficionados and stylish senoritas for not one, but two nights of not-to-be missed shopping and fun with the 2012 It Girl Spring Shopping Expo on February 29th and March 1st, 2012 at SOHO Studios in Miami’s Wynwood Art District. Gain and maintain it girl status by shopping and enjoying services from the must-have-it items in fashion, accessories, beauty, fitness and lifestyle including: American Laser Skincare, Anastasia Eyebrows, Antonym Cosmetics, Arrive Chic, Biern Handbags, Bliss Spa, Blo Blow Dry Bar, Bvlgari, Chick on the Go, Cream, D.Find at Sunset, The Fresh Diet, Heart Tango, Haute Halo, Dog-e-Glow, Jo Malone, L.A. Boudoir Vintage, Laura Mercier, Lipsmart, Mary Louise Designs, Miami Liquid Suntans, My Intimates, Nordstrom, Pamela Bond Skincare, Punch Gym, Ready Set Cupcake, Smashbox Cosmetics, StriVectin, Susan Joy Designs, Suzie Squeeze, Tarzan Cup, VIGI Boutique, Vivid Glam, Winks by Georgie , Zico Coconut Water, Hip e Boutique, Lip Smart, Pamela Bond Skincare and more. Guests attending the It Girl Expo can shop, nibble, mingle and vibe to the sounds of the event’s on-site DJ, imbibe complimentary cocktails from SX liquors, Brugal Rum, as well as sip wine gratis from The Naked Grape Wine Bar, sample popchips’ newest flavors and watch a fashion runway show. On March 1st, Nina Alicia, co-host of Y100’s Michael Yo Show, will make an appearance to meet and greet the stylish and savvy attendees. For those looking to dine, South Florida food trucks including Purple People Eatery, Miso Hungry, The Red Koi and Sugar Yummy Mama will be on-site to satisfy every craving. As an added twist, fashion and style bloggers from around South Florida will be updating their blogs live from the It Girl Expo Blogger’s Corner, sponsored by Meinto.com. Guests can stop by and meet the bloggers, get style advice and maybe even be featured online. Every it girl needs (at least) 15 minutes in the spotlight. Tickets are $25 for general admission and $35 for VIP. 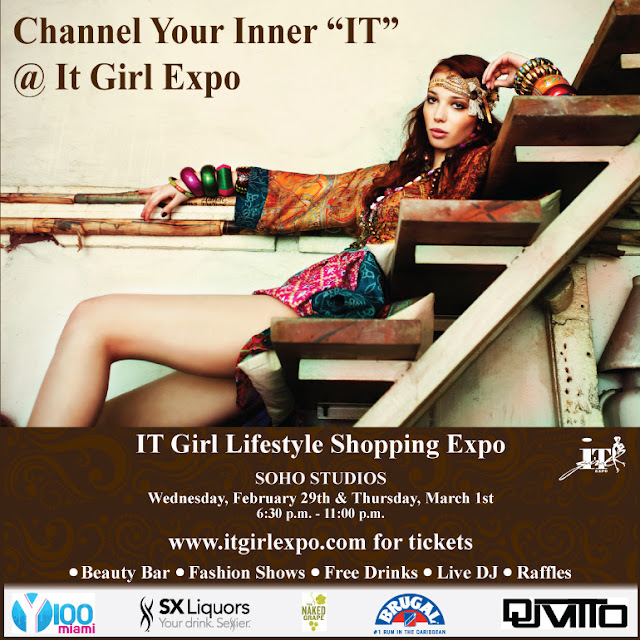 A VIP ticket grants early entry into the It Girl Expo as well as goody bag of products to further enhance it girl status. Chic Streets and Eats readers get a $5 discount when purchasing tickets online before the event. Enter code: chicstreets at checkout. You can thank me later! So come on over and keep me company pretty please! spend the evening hanging out, shopping and mingling with fellow fashion lovers! find me at the Meinto.com Blogger's corner.